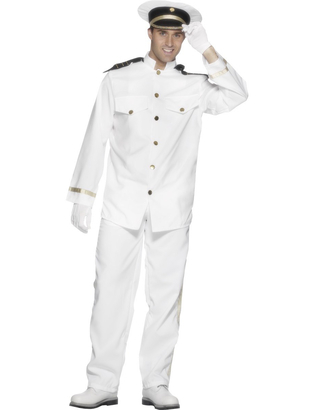 Budget Navy Officer Costume includes white navy officer jacket, golden coloured buttons and faux pockets, matching trousers with golden trim, white gloves and officer hat. 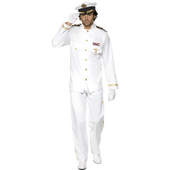 Ideal for a film theme party to become Richard Gere in An Officer and a Gentleman or Tom Cruise in the legendary Top Gun. 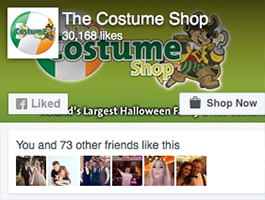 Please note this costume is large fitting. X Large: Chest 46" - 48"
Very generous sizing so I'd recommend dropping down a size from your normal fit. Thin Material but this actually worked out in my favour as the party was in a night club and it was roasting there. I got this outfit yesterday... Very happy with it.. 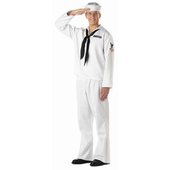 The suit is quite light, and you would have to wear white underneath... Its not going to take a lot of hardship, but it looks the part. I got the medium size, and it is generous enough in size. I was tempted to get the larger one, but glad I didn't..
delivery very fast, it was what i expected and i look very handsome as my girlfriend told me. its a very good buy. Received this costume today for my boyfriend. great quality. Was worried that a medium wouldnt fit him but there a big fit and the trousers are elasticated. Great Buy! 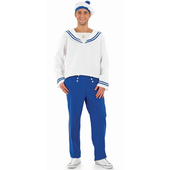 Great costume, nice to wear and gets loads of attention. We got a bunch of these for a stag weekend. Would definitely recommend.